Humans go to desperate and expensive lengths to try to look cool: Designer clothes, bling, fancy hair-do, and of course cool shades. But a cat is chill AF without trying, a feline even looks cool taking a dump in the litter box. 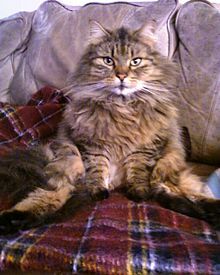 I`ve posted tons of pics of my kitties on Facebook, and I never have to pose them in a manner that makes them look cool. They are naturally cool, all I have to do is snap the pic. Click the link at the bottom of the page to see photos and a video of a cool cat lying on his back on his owner`s backpack in a bank in Brazil. In crime-ridden Brazil humans can`t afford to be chill in a bank because a bank robbery make break out at any time. But a cat`s default mode is chill, and they are chill anytime and anyplace. The only complaint I have is that the cat is wearing sunglasses! Talk about overkill, the kitty doesn`t need shades to look cool.